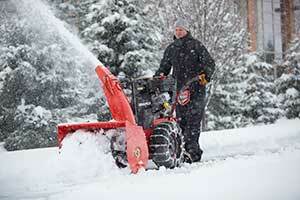 Gravely unveiled its new snow blower head attachment for its Pro-QXT Tractor. This attachment will be available in authorized Gravely dealerships only beginning in October. The new two-stage snow blower attachment has a 32-inch clearing width, a 21-inch housing height and a throwing distance of up to 60 feet. The Pro-QXT’s snow blower attachment has a cast iron gear case and commercial skid shoes for added durability. The snow blower attachment also has a remote deflector control, an ice drill chute rotation and an all-steel, adjustable scraper bar for comfort and ease-of use. The snow blower head comes with a one-year commercial warranty. The Pro-QXT Tractor is built for commercial use, with a clutched hydraulic system allowing for easy starting in extreme cold weather conditions, integrated engine fan debris cutter, trailer tie downs and adequate clearance for maneuvering around trailers and curbs. The Pro-QXT features an all-season Subaru engine with 12-volt electric start and recoil assist. Two additional attachments are also available for the Pro-QXT: a 44-inch Power Brush and a 48-inch blade. The blade attachment is also available with an optional poly scraper edge, and both attachments come with a one-year limited warranty.